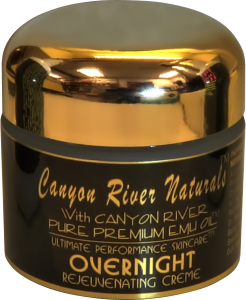 OVERNIGHT REJUVENATING CREAM is the most luxurious overnight treatment you will ever use. This unique combination of night time moisturizer and eye cream combines the remarkable qualities of EMU OIL with state of the art ingredients to penetrate the skins surface and deliver these youth oriented ingredients to the deep cells of the skin. This moisturizer contains 6 times the amount of Emu Oil as our other facial creams! Note : Our blend of oils in addition to our unique non-destructive Emu Oil provides a high concentration of myristic, palmitic, palmitoleic, stearic, oleic, linoleic, and alpha linolenic fatty acids for extra healing and repair.